You are joined on this top-rate tour by an expert marine biologist, who will help you sight and understand the humpbacks of Puerto Vallarta. Watch them in awe as they breach (jump out of the water) time and time again. 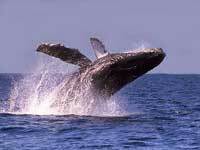 Possibly experience the magic of a baby whale - it is calving season in Puerto Vallarta. Your guide will also use the hydrophone so you can hear the song of the humpback. 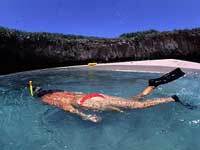 Take the boat all the way to the marine preserve of the Marietas Islands for optimum viewing. This is a small group tour with a maximum of 10 people per boat. Runs: Monday through Friday from December 8th through March 23rd only from 7:30AM to 3:00PM. Includes: Lunch at a Seaside Restaurant at El Anclote Beach, Certificate showing you have aided in the study of Humpback Whales, expert Marinebiologist Guide, educational session about the humpback whales, possible dolphin, orca, sea turtle, and manta ray sightings. Departs From: Puerto Vallarta, Marina Vallarta, Bucerias, or Punta Mita. Directions will be provided with your confirmation. PLEASE SEE OUR ZODIAC WHALE WATCHING. OUR ADVICE: This whale watching tour is on a small boat, which will allow you to get closer to the whales. However, the view can be obstructed if the water is choppy. We recommend the larger boat if you get seasick easily.